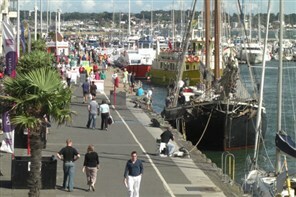 Enjoy a day out in Poole, Dorset, famous for its pottery. Enjoy a day out in Poole, Dorset. Poole is a town rich in history and famous for its pottery. Take in Europe's largest natural harbour and Brownsea Island. Soak up the bustling Quayside with its vibrant atmosphere, busy marina, beautiful views, factory price shopping, boat cruises and a wide choice of restaurants, cafes, bars & pubs to visit. Explore striking parks and gardens. For spectacular gardens Poole is hard to beat - home to the famous Compton Acres, which are reputed to be the finest gardens in Europe. Home to a selection of the South West's best restaurants with the freshest fish from the bay (including locally caught oysters). Experience Tower Park leisure and entertainment complex.